Washington Post article, "The birth of the D.C. flag"
G. M. Thornett, Secretary of the Board of Commissioners; and the Commission on Fine Arts. A flag contest was announced to secure a design. On October 15, 1938, the design made by Charles A. R. Dunn was selected for the flag of the District of Columbia. Dunn had first become interested a flag for DC in 1917. At the time he was employed to do graphics work for the Thomson-Byron-Ellis Company, specifically working on putting together U.S. state flag designs under the direction of Lt. Commander Byron McCandless. This work would become the October 1917 Flag Number of the National Geographic. In this work, the District of Columbia was represented by the DC National Guard flag. In reviewing the state flags, Dunn was impressed by the flag of Maryland and not impressed by the flags of states that depicted their seals on the flag. Dunn would soon enlist in the Army and it would not be until he returned in 1921 that he drew up a flag proposal, consisting of the coat-of-arms of George Washington (two red bars and three red stars on a white field). In 1924, there was a brief push to adopt a flag for the District of Columbia. Although short-lived, the Evening Star newspaper published at least two of the proposals it had received. The first, on February 20, was sent by John Mackaye Dunbar and featured the shield of the arms on a red-white-blue field. Although Dunn's proposal was received prior to February 20, it was not published until March 15 and was different from his original drawings in that he used cobalt blue for the stars instead of red. 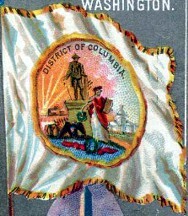 The DC Flag Commission decided to include in its search all proposals received prior to 1938 as well as new selections. Dunn sent in his 1921 red-star proposal. The chart he provided also depicted ways the flag could be used in designing flags for local governmental agencies as well as civic organizations. On August 24, the Evening Star reported that the Flag Commission was deadlocked between two designs: Dunn's and a proposal by Mrs. George T. Hawkins. Mrs. Hawkins' proposal featured a large star (color not specified in the article) on a blue field, surrounded by 48 gold stars. The large star would be divided into 13 parts representing the original colonies and would feature in the center either the U.S. Capitol Building or the shield of the Washington coat-of-arms. The Evening Star also cited that the Commission made "no claim that the flag was the work of A. E. DuBois" or Captain Hopping. The two proposals were made into flags and the selection made by the Flag Commission was with the advice of the Commission on Fine Arts. The flag was first hoisted at the International Horse Show held in Washington in October, 1938 by Commissioner Hazen. Charles A. R. Dunn, The Origins of the District of Columbia Flag, Records of the Columbia Historical Society of Washington, DC, 1957-59 (1961), pp. 82-86 with unpaginated plate. Government of the District of Columbia, untitled monograph, 1963, pp. 21-23. "The proportions of the design are prescribed in terms of the hoist, or vertical height, of the flag as follows: the upper white portion shall be 3/10 of the hoist; the two horizontal bars are each 2/10 of the hoist; the white are between the bars 1/10 of the hoist; and the base, or lowest white space, is 2/10 of the hoist. The three five-pointed stars have a diameter of 2/10 of the hoist and are spaced equidistant in the fly, or horizontal, dimension of the flag." Source: Government of the District of Columbia, untitled monograph, 1963, pp. 21-23. "In the absence of any official flag for the District of Columbia, the District Militia devised the one reproduced here, and until such time as it shall be replaced by law, it will be the flag of the District of Columbia, just as formerly the one with the hatchet has that status." The device on the center (the Capitol dome in front of a rising sun) is still the crest used on coats of arms of units of the District of Columbia Army National Guard. It is, therefore, still flag relevant since it appears on the regimental and battalion colors of such units. I came across a supposed flag for the Washington, District of Columbia listed as "1888 N6 City Flags WASHINGTON **AA-1793**" on eBay (www.ebay.com/itm/120608252214). Checking our page, I find that there was no official flag for the District of Columbia prior to the current flag's adoption in 1938. Previous to that the District Militia's flag was informally used. Looking into the District's history on Wikipedia, several entities formerly existed in the District prior to 1871: City of Alexandria, the County of Alexandria, Georgetown, the City of Washington, and the County of Washington. The Virginia part, the City of Alexandria and the County of Alexandria returned in 1846. source: Wikipedia. So my first though is that the flag represented the pre-1871 City of Washington, but a second look at the Washington, DC city seal adopted in 1871 says otherwise. (About DC) The seal on the flag seem to be a (more life like) variant of the seal show on Wikipedia. As a side note, a 1876 reported version of this seal has the Statue of Freedom instead of a George Washington statue. It remains a federal district, separate from the 50 states, just as it was when it was established in the late 1700s. (About 40 square miles were given back to the State of Virginia in the 1840s because they thought that there would never be enough bureaucrats to fill the original 100 square miles. Boy were they wrong!) The District has obtained a certain amount of "home rule" since the 1960s which means that the citizens may elect a Mayor and a City Council, however they have no voting representative in the U.S. Congress. George Washington's arms were two horizontal bars on a white field, with three red mullets (5-pointed spur rowels) in the chief. The design is seen on the side of DC official vehicles, on the license plates, etc, and was adopted as the flag of Washington, DC, in 1938. (Ironically, one of the largest examples of this flag flies on Pennsylvania Avenue and is incorrect in that the bottom "white stripe" is missing!) In the 19th century there was a belief that these design elements of G. Washington's arms were the direct antecedent of the U.S. flag. If that were true, then the U.S. flag should be called the "Bars and Mullets" not the "Stars and Stripes." Technically, the mullets should have holes in the center where they spun on the spur, however I think heraldry has deleted the holes as unnecessary. This means that mullets end up looking exactly like five-pointed stars, which is why folks made the connection between George Washington's arms and the U.S. flag. Sir Lawrence Washington came from the same family as the famous American President. His memorial plaque in Garsdon Church bears the Washington coat of arms - the "Stars and Stripes" as the bars and mullets became when the Americans wanted a flag of their own. This, and more, is from the booklet for the Festival of Flowers, Malmesbury Abbey, September 6th, 7th, and 8th, 1968. The US Capitol Police is a federal law enforcement agency charged with protecting the buildings and properties of the United States Congress, as well as members of Congress and their families, throughout the territory of the United States of America. It is one of a handful of law enforcement agencies that is responsible to the legislative branch of the US Government. The US Capitol Police have exclusive jurisdiction within the grounds of the US Capitol Building and concurrent jurisdiction with other law enforcement agencies for an area of roughly 200 blocks around the Capitol complex in the city of Washington, DC. When actively protecting members of Congress and their families, however, the agency's jurisdiction encompasses the entire United States. A photograph found online shows an honor guard from the US Capitol Police displaying flags on the Mall in Washington, DC (www.theblueflyer.com). The flag of the United States Capitol Police features the agency's shoulder patch displayed against a dark blue field.